I’m a big fan of saving money. And your prospects may be, too. That’s why I’m a big fan of a new kind of couponing-social coupon programs like LivingSocial and Groupon. Couponing can be a great way to attract new clients–sometimes it just takes an irresistible offer to get someone to decide to pick up the phone and make an appointment. And these programs are set up to be win/win/win, which is why I really like them. Let’s talk about Groupon first, because that’s the service I’ve used personally to save hundreds of dollars on local services and products. Groupon works with local businesses to create discount offers, which are then distributed via email every weekday morning to registered members. The participating business will set the minimum number of purchases required before the deal is “on.” So the company is guaranteed to earn a set amount of new business to make offering the discount worthwhile. As a member, if I want to get in on an offer, I click on a “buy” button in that morning’s email. When enough people join me on the deal, my credit card is charged. If the deal expires without enough interest, there’s no charge to any of the people who went in on the deal. And the part you’ll like best–the business gets paid immediately, once the deal is “on.” You keep half the fee, and Groupon gets the other half. So if you offer a $200 service for $100, you’ll actually get $50 net. (Groupon will work with you to create an offer that works with your price structure.) Here’s a list of Groupon’s participating cities. Typically, Groupons are valid for one year (like a gift certificate). But like gift certificates, many people will not redeem their Groupons, so your actual net at the end of one year is likely to be higher than $50 per sale. Another advantage? 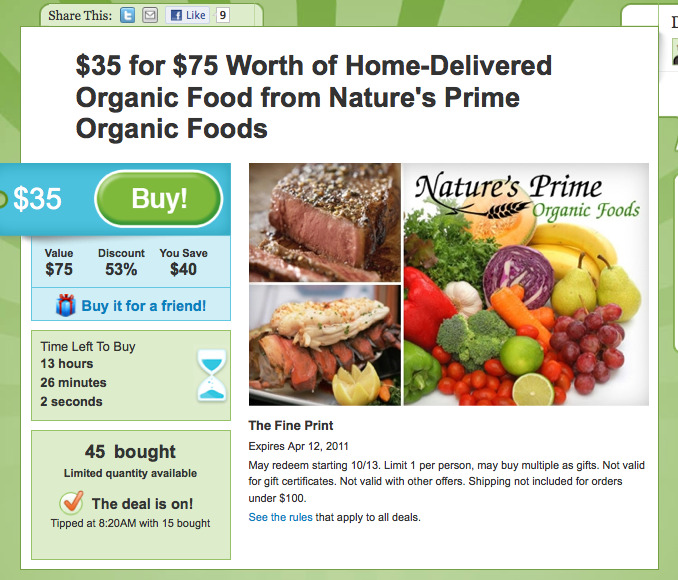 Groupon uses their half of the fee to do all the marketing and promotion of your offer and your business. They write very funny and engaging emails that expose you to hundreds (or sometimes thousands) of potential clients who may never have heard of you before. I’ve learned about several local businesses through Groupon that I never would have been exposed to any other way. Another bonus: Groupon deals with collecting payment and all the other non-fun administration issues. LivingSocial seems to work in a similar way. But to encourage members to promote LivingSocial and their offers, they will make a given offer free to you if you get three friends to buy the offer. Their website is a little hazy about how businesses are selected to participate. Here’s a list of LivingSocial’s participating cities. If there are already two players in the “social coupon” space, there are likely to be more. So stay on the lookout for new opportunities. Make sure you set minimum and maximum numbers of offers to both ensure that participation is worth your while, and that you’re not completely swamped by new clients you don’t have time to serve. If you have staff or receptionists who deal with new clients, be sure they’re aware of how to redeem the voucher. You’ll also need to prepare for an influx of phone calls the day (and week) that the Groupon or LivingSocial email features your business.